With current Government targets to increase health and social care practitioners, there is an increased need for informed mentors and preceptors to support the development of the students and new health professionals. Enabling learning in nursing and midwifery practice: A guide for mentorsseeks to underpin recent mentoring initiatives, exploring the impact of mentoring, supervision and preceptorship on professional practice, covering principles that underpin effective learning and providing practical guidance on mentoring and assessment strategies within practice settings. Enabling learning in nursing and midwifery practice: A guide for mentorsaddresses the inter-professional and policy context for mentorship, examines the nature of effective learning environments and provides mentors with the necessary tools to assist students in their development within a practice setting. It explores the use of reflective practice, virtual learning and other core resources to enhance and support learning in practice and addresses assessing practice, making correct judgements about student competence and the development of competence in newly qualified practitioners. 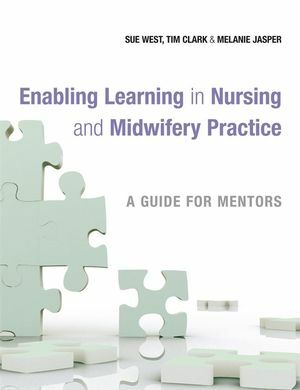 Enabling learning in nursing and midwifery practice: A guide for mentorsis an important resource text for practitioners seeking to support learning in practice as well as experienced mentors and preceptors seeking to update their skills and understanding. Sue West is Senior Lecturer in Adult Nursing at Canterbury Christ Church University. Professor Melanie Jasper is Head of School of Health Science, University of Wales Swansea. Dr Tim Clark is Senior Lecturer in Nursing and Applied Clinical Studies at Canterbury Christ Church University. 1 CONTEMPORARY ISSUES IN MENTORING PRACTICE (Margaret Andrews). 2 A GOOD PLACEMENT EXPERIENCE: THE STUDENT’S PERSPECTIVE OF THEIR NEEDS IN THE PRACTICE SETTING (Sue West). Clarifying the Context: Learning as Input, Process and Outcome. Input: An Effective Structure for the Placement Learning Experience. Process: Some of the Variables within the Learning Experience. Output: The End Result of the Learning Experience. 3 THE REFLECTIVE MENTOR: FACILITATING LEARNING IN THE PRACTICE SETTING (Melanie Jasper). Being a Refl ective Mentor. Practice as a Learning Environment. Maximizing Your Own Opportunities for Development. 4 HELPING PEOPLE LEARN (Stevie Penfold). Cognitive approaches to helping learners. Application of Knowledge for Practice. Practical Tips for Teaching and Facilitating Learning. 5 DEVELOPING EFFECTIVE LEARNING RELATIONSHIPS IN PRACTICE (Sheila Daykin). 6 LEARNING STYLES IN PRACTICE (Tim Clark). Clarifying the Context: What Are Learning Styles? Learning Styles – Which One Are You? Questionnaires That Examine Learning Style. 7 USING INTERPERSONAL SKILLS IN MENTORING (Sue Riddell). 8 THE LEARNING ENVIRONMENT (Gill Beer and Andrew Southgate). 9 THE DEVELOPMENT OF COMPETENCE IN NEW QUALIFIED PRACTITIONERS (Tim Clark). Adopting a ‘Cloak of Competence’. 10 ASSESSMENT OF PRACTICE: PRINCIPLES, PROCESS AND RESPONSIBILITIES (Sue West). The Journey to Professional Practice. Single Event Versus Continuous Assessment. Factors That Infl uence Assessment in Practice. 11 USE OF THE INTERNET TO SUPPORT LEARNING IN PRACTICE (Susan Westerman and Emily Hurt). Use of the Internet and Other New Technologies in the Higher Education and Health-care Sectors. Some Potential Benefi ts and Challenges of Using the Internet to Support Learning in Practice. Some Practical Applications and Illustrations of the Internet Supporting Practice-Based Learning. The Internet Supporting Communication, Interaction and Refl ection. How to Manage All This Information. 12 CHALLENGES IN THE INTERPROFESSIONAL AGENDA (Judith Parsons). Skills in Interprofessional Facilitation of Learning. 13 WORKING AS A PROFESSIONAL: STANDARDS FOR PROFESSIONAL PRACTICE (Melanie Jasper). Your Role as a Mentor.